Fijian Prime Minister, Frank Bainimarama sickeningly shakes hands with Indonesian war criminal, Secretary of the Ministry of Co-ordination, Political, Legal and Security Affairs Lieutenant-General Langgeng Sulistiyono after accepting a bribe of $500,000. The Indonesian Government, is bribing and trying it’s very best to support the leader of Fiji, Frank Bainimarama (who many see as a dictator) to not support West Papua and they have sent a delegation of high profile government ministers to Fiji in an attempt at what they see as “eliminating support for West Papua in Melanesia”. They will be holding a series of free, public propaganda based public lectures in Fiji this month to try to spread its lies of development in military occupied West Papua. The lectures will be held from the 4th to the 7th March in Fiji and will be free and open to the public with “all” invited to attend. Calling on support from brothers and sisters in Fiji, please attend and raise questions about genocide and illegal occupation in West Papua. Now is the time for all true Fiji Islanders to stand up for their Melanesian and Pacifican brothers and sisters in West Papua. Please print as many copies as possible and share and post them as much as possible around the University Campuses in Fiji. Help to share with your friends and get the Fiji Islander students involved in this essential campaign for the future of Melanesia. Please take lots of photos of these flyers and during the lectures. Send them to us via Facebook and we will be sure to post them and try to get the media alerted to Fiji people standing up for their fellow islanders in West Papua! There has never been a better time for true Fiji Islanders to stand up to Indonesia in support of their Melanesian brothers and sisters. The United Front for a Democratic Fiji (UFDF) has officially supported the calls for independence of our people in West Papua and condemned Indonesia for interfering in our internal Melanesian affairs whilst murdering our Melanesian people in West Papua. All friends and supporters from Fiji, wantoks and Melanesian brothers and sisters, please protest outside these lectures and try to attend them to ask the Indonesian government and all those present why they have murdered over 500,000 innocent West Papuan people, raped and tortured countless more and tried to cover up this genocide by bribing the PM with 500,000 dollars. Please follow this link to our event on Facebook where we shall keep you updated on the latest plans and progresses. “Why is the Indonesian military paid over 3 million S dollars a year by the largest gold mine in the world, operated by the USA in West Papua? Indonesia has had a long history of supporting Frank Bainimarama, regarded by many as a dictator to use as an anchor of their military and political influence throughout the whole of Melanesia. The Indonesian Government has effectively bribed him several times in the past to try to reduce support for West Papua and manipulate the people of Fiji to covertly supporting their secret genocide in Melanesian West Papua. Following the recent huge rise in support for West Papua in both the Melanesian Spearhead Group (MSG) and in the Melanesian public, the Indonesian government has given the Chairman of MSG 500,000 dollars. This is a very symbolic figure, Indonesia has paid Fiji about 1 dollar to try and forget the brutal murder of each of the 500,000 Melanesian West Papuans the Indonesian government has murdered during their 50 year illegal occupation of West Papua. That is the value of a Papuan life in the eyes of the Indonesian government. One dollar per person. 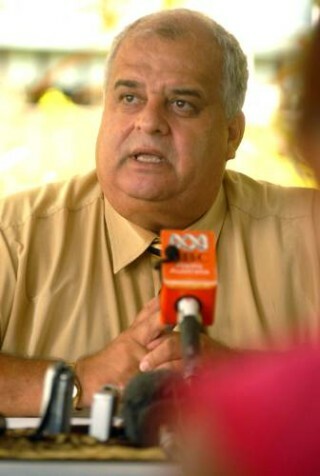 The Indonesian government steals about 1.82 million dollars a day from Melanesia through the Freeport gold mine alone. The current Chairman of MSG is Frank Bainimarama. He has had a much closer relationship with Indonesia than any other Melanesian head of state and he has been effectively bribed by Indonesia several times previously to keep out support for West Papua. Bainimarama received the money on behalf of the Melanesian Spearhead Group from the Indonesian government’s Secretary of Coordinating Ministry for Political, Legal and Security Affairs Lt Gen Langgeng Sulistiyonho (who is also a general in the Indonesian military) in Suva, Fiji on Wednesday 8th January. 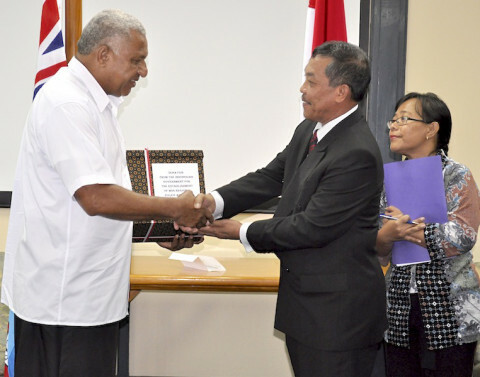 Bainimarama also admitted that the money given was a way to “further strengthen relations with Indonesia”. If Indonesia is doing this because it cares about Melanesia, why has it waited until now to make a donation? And why does it chose Fiji to give it to as opposed to say Vanuatu? “Our policy is never to interfere with other people’s internal affairs,” he said. This is a true disgrace and the government of Indonesia but also more shockingly to the government of Fiji, especially Mr Bainimarama and Mr Cokanasiga must be truly ashamed of themselves that they are selling their own Melanesian people down the river for little more than blood money. We fully condemn this outrageous and blatantly illegal string pulling by the Indonesian government in trying to stop the truth coming out about the genocide and illegal occupation they are still committing inside West Papua every day. But the Melanesian people rising up to support their family in West Papua. The Indonesian government cannot stop them. Not with 500,000 dollars. Not with all the money in the world. This is about more than money. It is about truth, justice and freedom. History will record those who thought 500,000 dollars would buy silence over the genocide of 500,000 West Papuans. Please attend, now is the time for all Fiji Islanders to support their fellow Melanesian brothers and sisters across the Pacific. With your support, we will succeed. We know that you, the true brothers and sisters of Melanesia just like Vanuatu and as with all our friends around the world, will always stand up for your fellow people in West Papua, and that it is with your support, that West Papua will finally join the Melanesian Spearhead Group and further to the Pacific Islands Forum and that ultimately, West Papua will join the world as a member of the United Nations and at last as another free brother of Melanesia. Help to pave the way for full freedom for West Papua and so all of Melanesia. 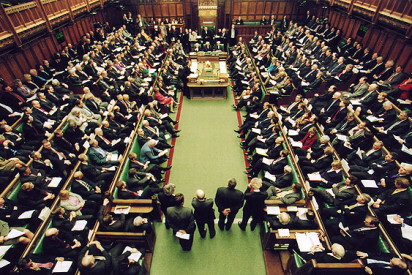 Call for all UK supporters to contact their MP and ask them to join the All Party Parliamentary Group on West Papua.